An attractive, well planned website is easily a freelance translator’s best calling card. In fact, more people are searching online these days for services than ever before. That’s why it’s vital to update your freelance translation business website from time to time. And the key is to keep your ideal client in mind. In the first session of my T&I Website Blueprint Course, 10 students committed to revamping an existing website or creating an entirely new one. The results that came from the students who took the course were truly amazing. 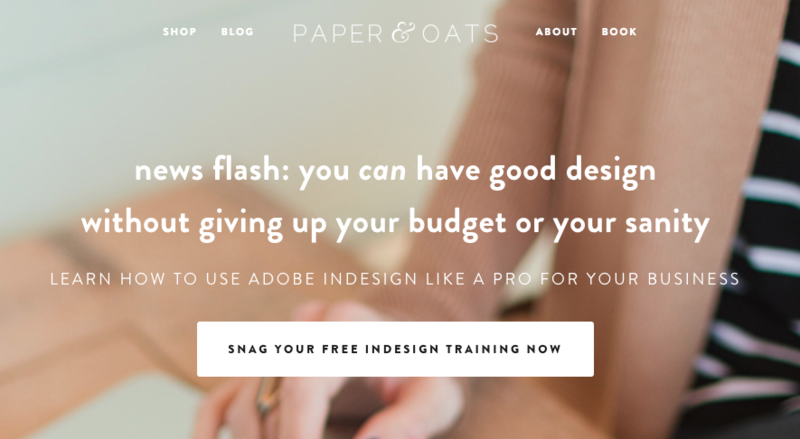 I’d like to share a few of the websites that were created in this course, including some really beautiful before-and-after images of updated designs, web copy and formatting that truly speak to these translators’ ideal clients. 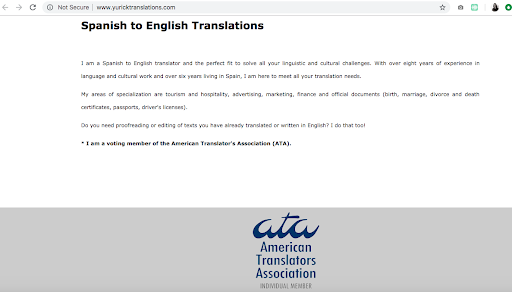 Since the first session of this course in 2018, I've received several messages from other translators expressing interest in taking the course as well. Stay tuned to the end of this post to find out how to receive updates about when I will teach this course again (June 2019). 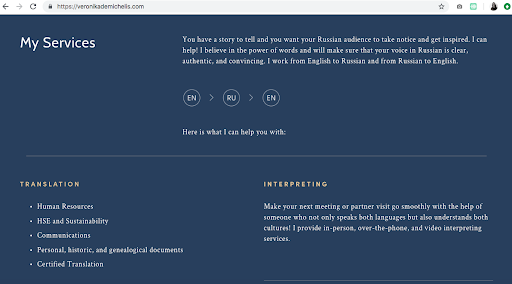 The first website transformation I'd like to share is from Molly Yurick (Yurick Translations). Molly chose to do a complete overhaul of her previous website. 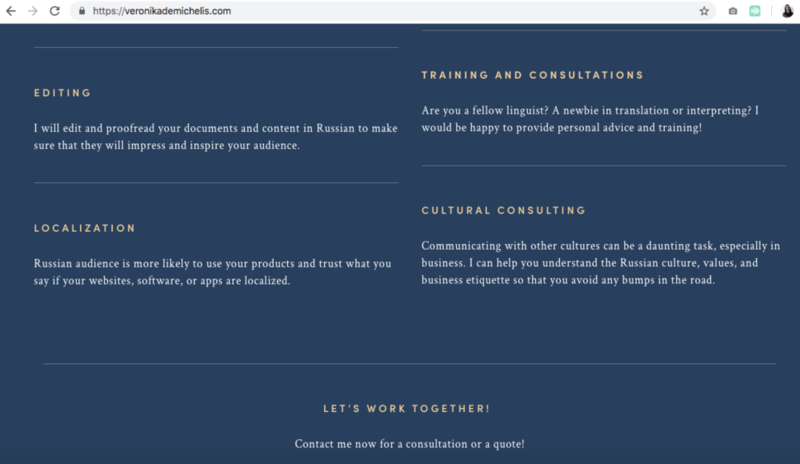 As you’ll see in the following images, she not only updated the look of her site, but she truly crafted a message and a feeling for site visitors that fits the niche industries for which she translates. Molly told me, “I had my website set up for me, but I don’t really have control over any of it. I’d like to completely redo my website so that I can make updates whenever I want.” So, when it was time to start the very first module, she was ready to tackle a brand new website. Molly’s previous website looked like this when visitors landed on the Home page. She told me that she didn’t feel any real attachment to the images on her site, including the one in the banner on the Home page. Now, her Home page looks like this! Not only does she use an image that appeals to clients in her niche areas of specialization (tourism, destination wedding planning and hospitality), but she speaks to them immediately in a succinct, well-crafted headline and sub-heading. The original About page of her website was very “text-heavy.” She had very little in the way of visual appeal. But she updated her About page copy, and now it is bold, clear and truly describes who she is and how she serves her clients. Molly’s previous Testimonials page was also rather plain, including a small font that made the copy feel less appealing than the new layout she created in the course. She wanted to share her expertise through client testimonials in a way that would resonate with her potential clients in seconds. She even included more images to appeal to those in her niche markets. She can get much more out of her new Contact page. Not only does she address her clients in both English and Spanish, but she uses a contact form that will allow her to gain more insight on those who inquire about her services. Tip: Always include a required question on your Contact page form that asks a client how they found you! The website Molly built in the T&I Website Blueprint Course is a solid step toward attracting her ideal client base. She made wonderful use of white space without cluttering the pages with text that could feel overwhelming. And she chose images and crafted copy that will really speak to those searching for her services online! 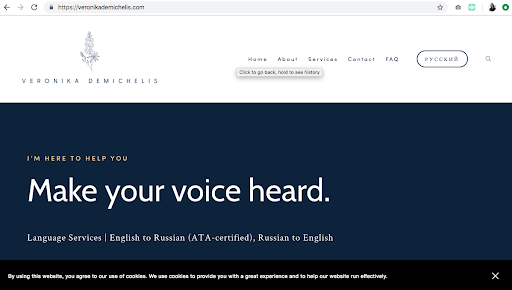 The second website transformation I’d like to share in Part 1 of this series belongs to Veronika Demichelis. Veronika’s case is a bit different. She already had a beautiful website, but she said, “It just doesn’t feel like the authentic me.” So, she enrolled in the course with the goal of updating the look and feel of her site to market herself in an authentic way and to truly reach those she wants to work with in the years to come. It may look like Veronika made fewer aesthetic changes, but don’t be fooled. Veronika took an already well designed site and made it feel more like her. She simplified the copy and used images that reflected the inspiration she had behind her new logo and visuals. Veronika’s original Home page looked like this (below). The sections below the fold became one long, scrolling page of content. But now, it looks like this! Veronika crafted content for each of her pages with a call to action (CTA) on every single page. This helps her clients know exactly what to do next. Not only did she update the content, but she wrote it in a way that speaks to her clients and not just about herself. This is essential in getting your content marketing right! Instead, she chose to create a “path” for clients to take so that they wouldn’t have to sift through information that didn’t relate to their needs. And it turned out beautifully! All her site visitors have to do is read a brief heading and service description in order to match their needs with Veronika’s niche services. Veronika’s updated website is a real reflection of who she is and how she serves her clients with value. 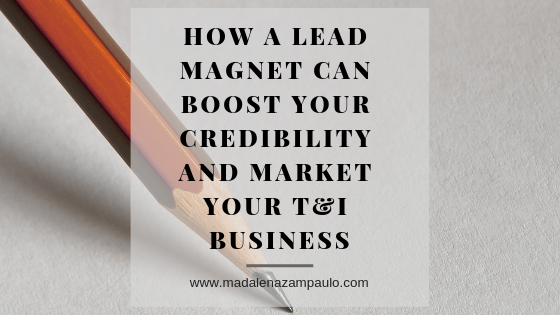 She took the copywriting and layout skills she learned in the T&I Website Blueprint Course and created a clean, sharp and incredibly appealing website that appeals to her ideal clients. Both Molly’s and Veronika’s new websites are much more in line with the vision these professional women have for their freelance businesses. Their content speaks to their direct clients. They’ve also told me how proud they are of their websites now. I know they will reap the benefits for years to come! If you, too, would like to update your website or create one from scratch, leave your name and email address at the bottom of the T&I Website Blueprint Course interest page and I’ll email you more information about the next session, starting in June 2019.